There is this awkward tension in our culture where we feel we have to choose between being minimalist and enjoying shopping. Why can’t we choose both? Just because we enjoy shopping doesn’t mean we buy everything we see on the shelves. I enjoy shopping! Strolling the aisles of a store is where I find inspiration and get refreshed. For me, it is about browsing and enjoying, without feeling the pressure to buy every single thing I find that I like. I'm not shopping to shop. I am shopping because I truly enjoy the process of being out and finding inspiration! And I know that like me, a lot of you would say the same. 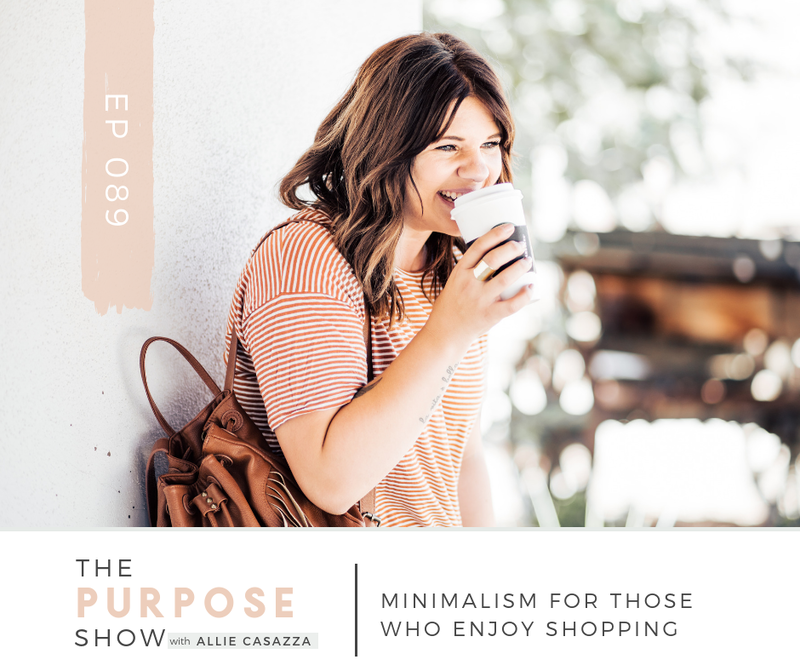 So I hope this episode encourages you to find freedom in being a minimalist who enjoys shopping. The two core reasons people love to shop and their impact on minimalism. Why her closet isn’t as minimal as the rest of her house. Questions you can ask yourself as you shop to help you decide whether or not to buy things you find. Anyone else love shopping? I do! When I go shopping and see something I love, I run through a list of questions before I buy it. This way I am checking my heart and intentions before making a purchase I really don’t need to make! Download this FREE PDF and image for your phone so that you can have these questions with you when you go shopping! I WANT THE GUT CHECK QUESTIONS! Hey, beautiful lady! Thank you for listening today! I’m really glad you're here! This episode…I've been feeling weird about this episode - and I'm just going to say it - because in what I do, there's another type of person. And that person is very extreme. Minimalism for the sake of minimalism. It's less for the sake of less. They know how many of everything they have and they're really set on “I can't have more than this amount of stuff because then I'm not a minimalist” and I just am not that way. I hope that is what draws you listeners to me, because it is different. It's not that there's anything really wrong with the other way; I just don't vibe with that. It's not how I am. I don't like anything that feels really legalistic and limiting – ‘now I feel like I can't be who I am because I want to be a minimalist. I'm having to change who I am and say ‘no’ to things that totally bring me joy and add to my life in a really positive way with no negative side effects because it's not minimalist’ - I just don't like that. A lot of times people will come to me and talk to me in that tone…like I'm like that. And I always have to redirect them and say, “Well, the way you're asking that question is very minimalism for the sake of just being a minimalist and that's just not how I think. So, let me redirect you, ‘rephrase’ this for you, and help you make this decision about this area of your home under this mindset instead.” And it's something that I have to say over and over again, almost daily, because it is such a common thing in minimalist teachers. Whenever I talk about what I'm about to talk about, I get a lot of flack and that's okay because I think if you're not getting any negative feedback you’re probably not really doing anything that's worthwhile. But I also get a lot of positive feedback. So I'm just going to lay it out on the line. This episode has been on my heart for a while because it's for me. I'm talking to me. Minimalism For People Who Enjoy Shopping. So we're gonna just dive in. There are one of two hearts at the core of someone who says they love to shop. One, they're filling a void and they are addicted to the ‘high’ that comes with shopping, which is totally a thing. Look it up. Or two, they're like me, and they just like being out alone – browsing, walking, looking, getting inspired and finding the occasional perfect thing they have been looking for. They also might just like clothes and like putting outfits together and like fashion, which is also me. So that's kind of what I've learned, that there's 1 of 2 hearts at the core of somebody who says they love to shop, and that's like a thing that kind of makes them panic a little about minimalism. So they’re either coming from total panic and anxiety like, “Oh my gosh, you’re going to take away my ‘drug’ because shopping is filling a void. I shop and I buy things incessantly all the time because I'm filling this void and I’m trying to get away from this problem and just fill a void.” Or they just really enjoy the process. So, check yo’self before you wreck yo’self, right? Where is this coming from? What's the heart? Where are you at? But if you're like me and you just like the process of shopping, don't you dare feel guilty about that. That's ridiculous. Especially because most of us listening are mothers. Of course you like to shop. You can get away from your kids and browse and take a deep breath. My favorite thing to do in the whole world, seriously, no joke, is to get my headphones, go to Target, order a coffee, put in a podcast or a song and just walk and breathe and I don't have anything that I need. I'm just there and I'm just looking and browsing. I have self-discipline and I am a minimalist. I don't grab incessantly needless things. I don't feel the need to do that. But that's how I get inspired. That's how I refresh and recharge. I'm alone. I'm out. I love looking at things and like, “Oh look at that. It's so beautiful. That is something that I could do with that one corner of my house I've been wanting to get decorated. That's a great idea!” It's just refreshing to me. I don't know. It just is. When moms tell me that they want to simplify their homes and go minimalist, but shopping is their joy, it's their escape, and they don't want to hate themselves, I totally get it. I love shopping. So, here's what I hate – “Why don't you just walk around outside instead? Why do you have to walk around at Target?” Umm…because I don't want to walk around outside. I want to go to Target because it's hot or cold or wet, and there are bugs out there, and rapists, and other kids climbing trees and stuff, and because…Target. I want to go where I want to go. Leave me alone. That's the kind of legalist BS that I really just don't like. And secrets-behind-the-scenes’ peek - it's made other minimalists not like me either. And that's okay. But seriously, browsing is how I get inspired and refreshed. Who cares if I leave the store with something for my bookshelf. Leave me alone. I'm not about this like, “Oh, I’m a minimalist and I don't need to go to the store. I just sit on my rug and do yoga, breathe deeply, surrounded by all white walls with nothing fun in the house. I wear a black T-shirt every day because even though I love fashion and I love putting outfits together that's not minimalist and that is just what I am.” No, you're never going to find that from me. Hey guys! Have you heard? Declutter Like A Mother is coming back! I'm super excited! This is my annual challenge. I'm beyond ecstatic to even be saying this to you guys! I also enjoy making trips to the store for necessities and I like to make that a nice experience. Here's what I mean by that. I am home a lot, you guys. My life might be a little different than yours. So just consider my life as you take this in. My life is home all the time. I homeschool my kids. I work at home. My office is literally a part of my home. I walk out the door and I'm in my office. I even do a lot of my working out at home because we have a gym in our garage. So I'm home for pretty much everything. When that happens, you notice that you're out of paper towels and you kind of get this like, “Oh, I'm out of paper towels! I need to go to target.” And I love that. I totally make it a thing. I tell Brian like, “Hey, are you good? Are you good with the kids? I would love to just get out for a second.” Sometimes he'll do this too. Sometimes we all do it together and we'll let the kids get a little apple or a little snack bar or something and we'll all go to Target together. Just walk around, be together and talk. Brian and I will get coffees. The kids run alongside the cart because the store is empty because we homeschool and no one else was at the store in the middle of the week in the morning. And we just be. I love making my trips to the store for necessities a nice experience. So, I will go to Target because I need paper towels, but I'll bring my headphones, get a coffee, take a deep breath and browse. I'll be there for an hour and leave with just paper towels. It's about browsing and enjoying and not buying every single thing. Just because I find something that seems like, “Oh my gosh! This is perfect for me. I love it. It's so cute.” doesn't mean I buy it. I have another episode that I did on this that I'll link to where I talk a little bit about this, not having to buy every single thing even if it seems perfect and, of course, you have to buy it – no, you don't. Sure, that kind of stuff happens, but I'm not shopping to shop. I'm not a minimalist for the sake of being minimalist and I'm not shopping for the sake of shopping, you know? Just buying stuff because I'm out. I can enjoy and appreciate something and not get it. It's more about being out and about and enjoying that process. I've talked about this so much. I don't want my podcast to be super repetitive, but when it comes to clothing, I love to shop. I don't get cheap crap at Target and stuff really anymore. It's pretty rare that I will leave with a piece of clothing from Target. But you know, like the other day, it was a holiday weekend and my family went down to Carlsbad because we live in California, and we were just walking around. Brian needed some new tennis shoes. His were worn out and had holes in them and he went to go to the Nike store and there was a Madewell there. I love Madewell. So, I went in and I was looking around and I found a beautiful sweater. I loved it and I bought it because I loved it. I've worn it three times already since then. So yes, I love to shop, but it's not shopping for the sake of shopping, buying everything that you see that you like. Where is your heart? Where are you coming from? I really hope this is resonating. I really hope this is making sense to you guys. I never want to misconstrue my message. Why are you doing something? Are you doing it because of being, oh, you're a minimalist so you can't buy jeans? Or you don't need that, so don't get it, otherwise you're the worst. Or are you doing something because it's an area of your life that you want to simplify? What's your purpose? What takes up your space takes up your time, right? We talk about this all the time. Of course, it is important to be minimal and to be a ruthless editor of what comes into your home, but not in everything to where your joy is totally sucked out of you. I'm going to link in the show notes to this episode to a video that I made about this, about my story with doing this to myself. Having a capsule wardrobe and being very extreme, limiting my capsule wardrobe, limiting my clothes and how I started to really almost get a little depressive because I wasn't able to be myself, and have clothes and outfits to put together and play with that area of my life. I love that. It's a huge part of who I am. If I wasn't doing what I am doing now, I would probably either own a flower shop because I love putting flowers and bouquets together or I would do something with fashion, clothes, styling and dressing for your shape. I love that kind of stuff. I'll link to that video in the show notes that you can get at alliecasazza.com/shownotes/089, if you want to watch that video because it's all about that. I won't bore you with it again here. Be an editor of your home. Get intentional with what's taking up your space because it's taking up your time too, but don't do that just for the sake of being a minimalist to where your joy has totally left you and a big piece of who you are is just not getting satisfied because you're trying to be minimal. That’s no fun. That's not what this is about. For a personal example, a lot of the areas of my home and my life are super minimal versus my closet and my wardrobe, which is not super minimal, because that brings me so much joy and it's such a huge part of who I am. So my kitchen - my kitchen is very minimal. We do not have extra dishes and stuff. I don't love being in there and love cooking all the time. I do what I have to do and then I'm done. So, I have the storageware that we need. I have the Tupperware that we need. I have the pots and pans that we need and the spatulas that we need. I don't have anything that I don't really need for how I cook for my family because it's not an area where I feel really inspired. I have students in Your Uncluttered Home who have told me, “I feel like a chef. I love cooking. I love getting creative. I love being inspired in the kitchen. I want to have all these extra appliances and all these extra things to try even though they're not necessities and I don't use them all the time.” That's fine. That's their area where they want to get messy and they like to have joy and they like to have a little bit of excess. They'll deal with it taking up their time. They'll deal with that taking up more space and time because it's worth it to them. Because it's joyful for them. I'm not that way. My kitchen is very minimal. My kids' toys are very minimal and all of the stuff that most people have in their drawers and their closets – mine is super, super minimalistic - but not my wardrobe. Make sense? To help you guys out, I'm going to leave you with this. Here are some questions that I run through in my head to make sure that I'm not needlessly buying something when I'm out shopping and browsing and just walking around. You can write them down. You can keep them in your phone or you can go to the show notes for this episode and just download them. It's a pdf you could just save to your phone to have on hand. Question #1: Is this something that I had been planning to buy for some time? Is this a planned purchase? Not just a random, you know, I'm going to get this. Question #2: Is it necessary? And keep in mind, please, that these questions or not, “If the answer is ‘no’, you can't get it, because that's minimalist for the sake of being minimalist. But this is just some things I just do to remember, check yourself before you wreck yourself. So these are just kind of gut-checking questions that you can ask yourself to kind of feel out where you're at. Question #3: Is it replacing something I no longer have or have now, but I'm planning to get rid of? Question #4: How does this add to my life or improve the lives of my family? Question #5: Do I own a version of this that works just fine already? Question #6: Will I love this in a month, or a year, or 10 years (applicable to what the item is). For example, it's not super likely that you're going to love the same wall art 20 years from now. That's a given. But if you think you'll be sick of it by the end of this current year, maybe it's not right for you. Maybe that's not a smart way to spend your money. Question #7: Also is it decorative or functional or needed? Why are you buying this? These are just things that you use to check yourself. If you want to get this list of questions - I have this in my phone, literally I have it in my notes - I put it on a pdf for you. Just go to alliecasazza.com/shownotes/089and you can download that and put it on your phone. Super helpful. 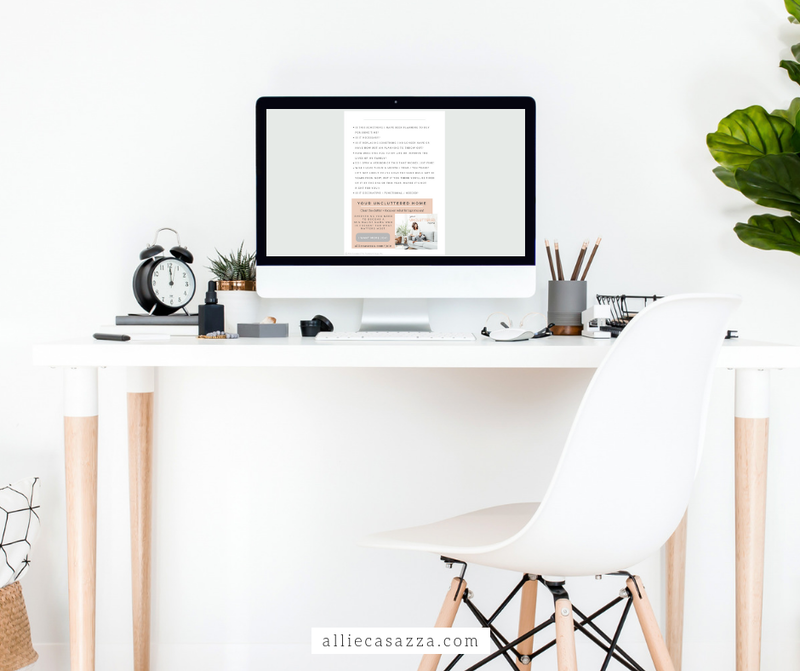 If you do enjoy shopping, but you feel like you've overdone it in the past and you're worried that you're going to undo your minimalist work, just have this list of gut-check questions for yourself and that can be super helpful.